The advancement of the technology is very fast and the needs of the user(us) is very influence. From the use of the computer PC, Portable computer, Notebook, and gadgets such as the very well noon operating system of it called Android and IOS from Iphone. Buying this gadgets needs a certain budgets that to much high cost of our wallets and during unpacking of this gadgets include now the budget once the troubled encountered in the future use. Using a gadgets such as this ASUS Memo Pad we must take safety in using this. Not for the seek of our self safety but to the gadget itself because it will hindrance to our budget daily. Because you will budgets for the repair of the gadgets that have trouble. Our common attitude that we will charge the MEMO pad even it is on and sometime we use it and perform charging. This is very harm and dangerous in the side of us because probably it will burn the internal parts of the units because of to much temperature. Use the rounded side of the twizzer tool not the sharp end(just follow the Youtube video embedded in this post) Remember that to open this gadgets is very dangerous you will probably touch the flex wire inside. You must apply a proper care once you open the cover using the twizzer tool. Once you successfully open the cover you will see the batter and in the side of it is the battery wire connected to the circuit board. Just use your twizzer or your finger to remove the connector of the battery from the connector of the circuit board. You must also careful when doing this because you probably touch the very this component of the circuit board that may cause damage to the circuit board. And avoid touching the Chipsets by your bare hands that may cause Electrostatic Discharge(ESD). 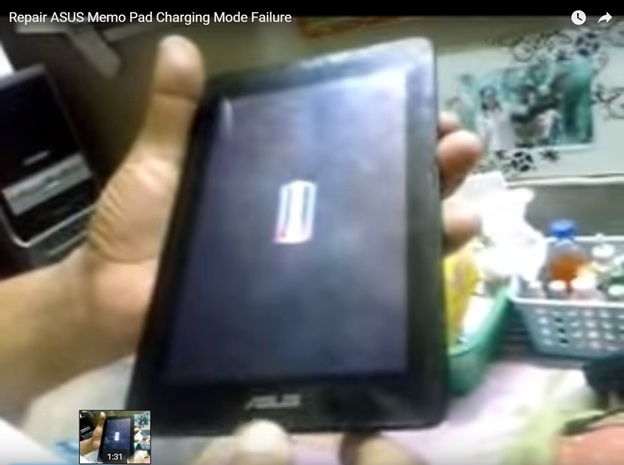 And test the ASUS Memo pad using his AC ADAPTER. Once it will display the ASUS logo during POST just wait until the booting or initialization of the OS will finish. Once it normal and displayed the ICONS and background your done. You can use now again your gadget Note such as this ASUS Memo pad model KOW(ME172V).